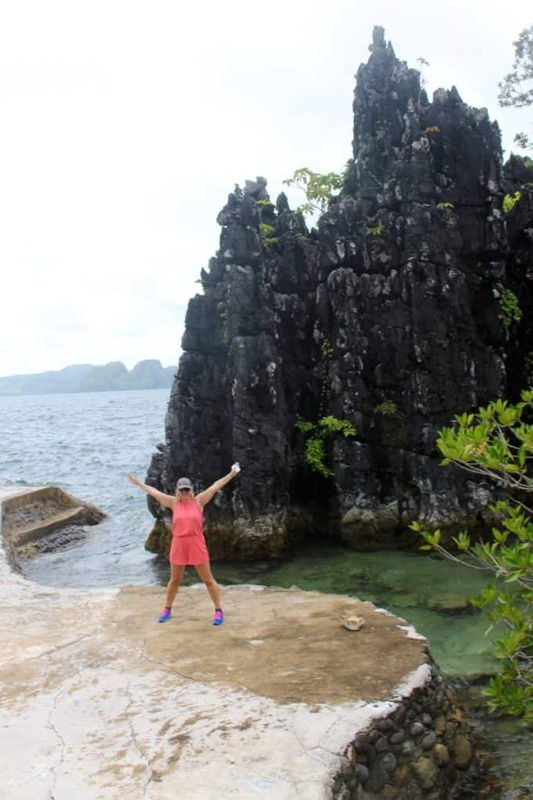 You will certainly not get bored if you spend few days on the El Nido Islands! 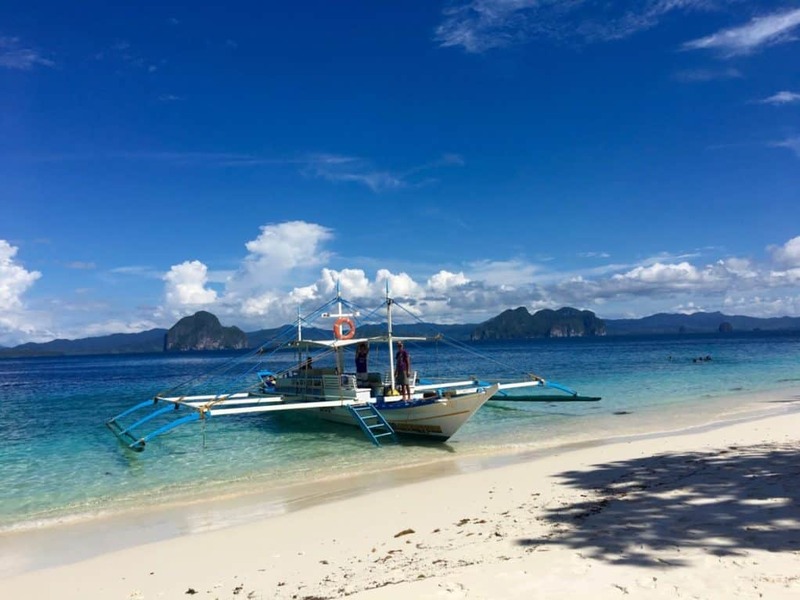 The El Nido Resorts gave us a boat, crew and guide for the day and it was such a special day. The day started with a boat ride to Little Lagoon, Miniloc. The ride itself is a treat, passing some of the most beautiful islands imaginable and the most crystal clear seas. 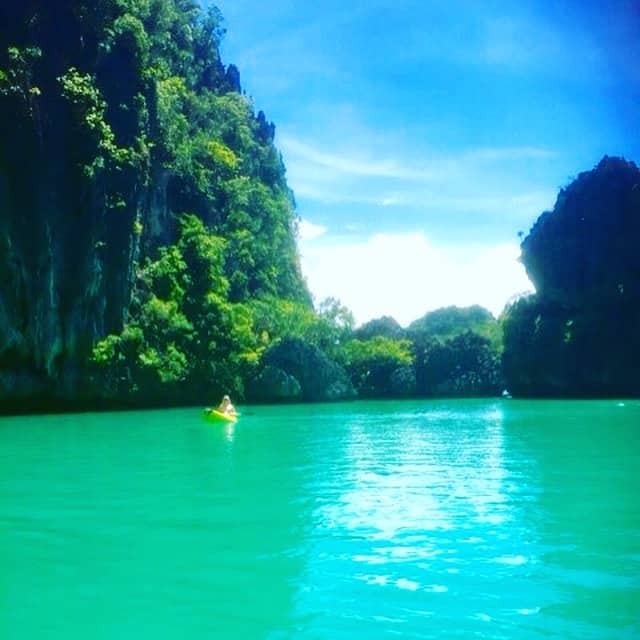 We kayaked through the Lagoon which was unimaginably beautiful, with limestone cliffs soaring above us. Do you love kayaking? Well, this is the best place in the world to kayak. Smooth waters and fantastic views. Next stop, Large Lagoons and we took the boat into the Lagoon this time. Next stop, Miniloc Resort and snorkelling! A fantastic array of fish on perfectly preserved coral. We saw Giant Trevally, Parrot Fish, Nemo, Moorish Idol, Regal Angelfish, Titan Triggerfish, Giant Clam and even a Green Sea Turtle! Spot the Giant Trevally swimming behind me! 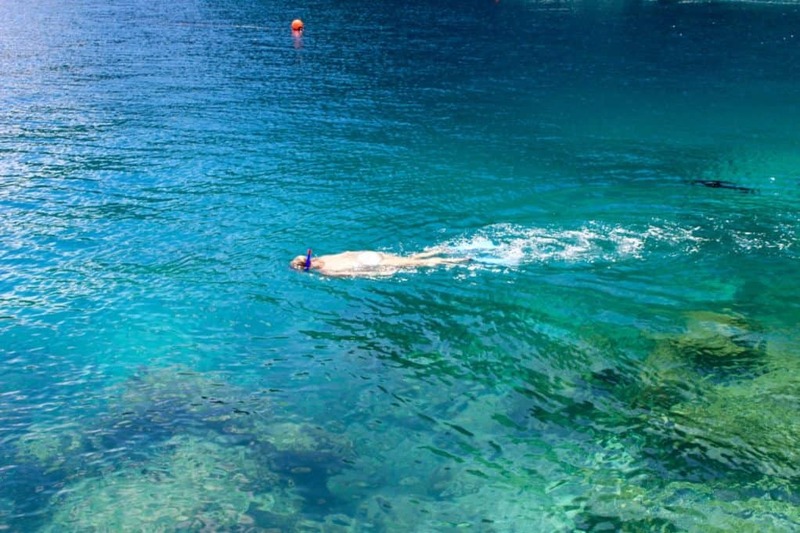 Top Tip: Snorkel with a guide, they know all the best spots! 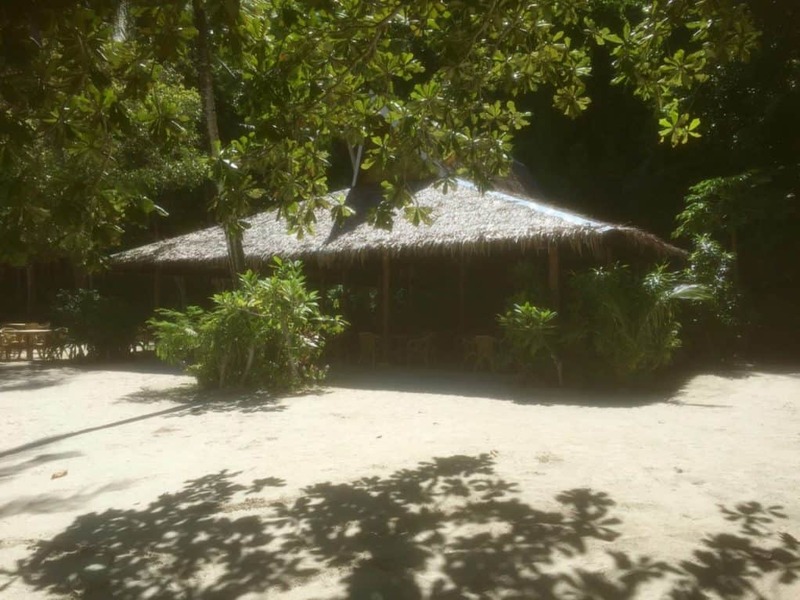 Lunch on Miniloc Private Beach, just for the El Nido Resort clients. A delicious picnic barbecue. A happy afternoon island hopping on our outrigger boat. Stopping to swim as we pleased and stroll along pristine beaches. 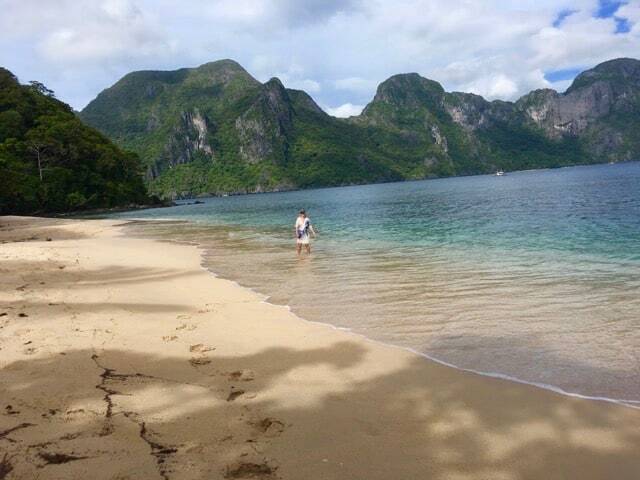 I have never seen such pristine beaches, thanks in part due to the rubbish collection co-ordinated by El Nido Resorts. Every guest is given an environmentally friendly bag in which to collect any litter, but we didn’t see anything to collect! 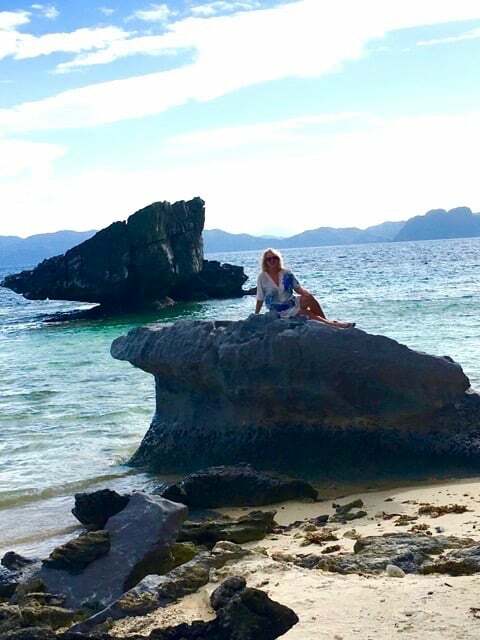 The islands were just magical and will be in our memories forever. A happy afternoon island hopping and so well looked after by our guide, Jamie. The next day started with a hike after the rain cleared. There are two hikes on Lagen Island one an hour long and another two hours. 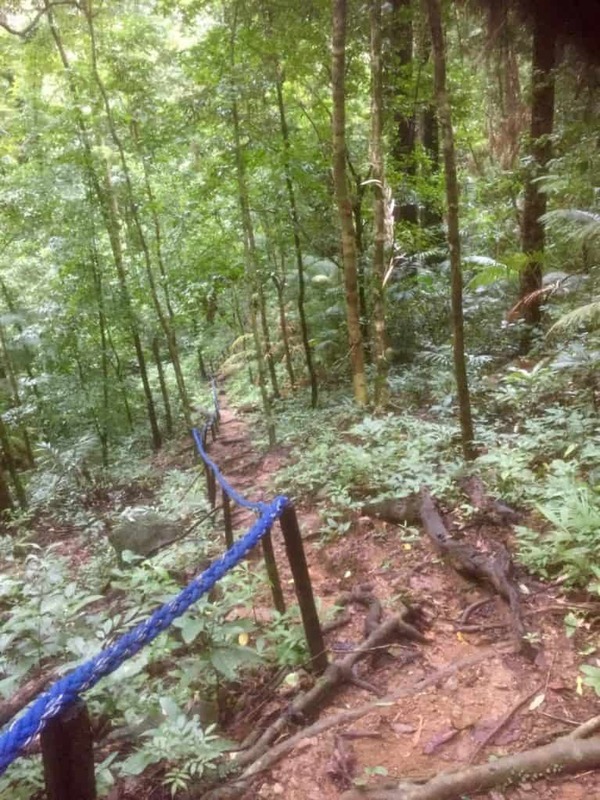 Glen is one of the larger islands and has wonderfully preserved forest with 16 varieties of Butterflies on the island, countless birds including Yellow Throated Leafbird, Olive-Backed Sunbird, Palawan Hornbill, White-vented shama and many more! The island is home to Long Tailed Macaque monkeys, Palawan Suirrels and Water Monitor Lizards. You don’t need to hike to see all of the wildlife, you will spot everything near your Water Villa! The selection of trees is extraordinary too and well signed so easy to spot. 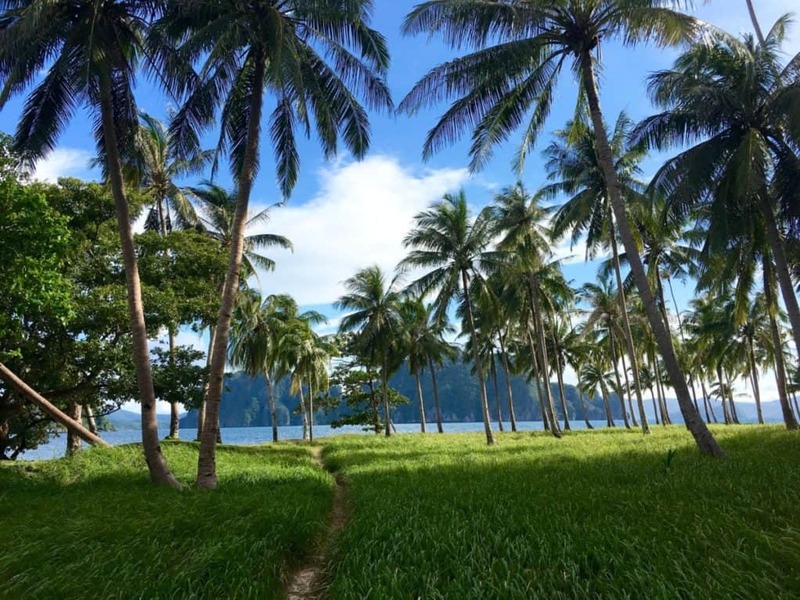 El Nido Resorts have done a wonderful job preserving the flora and fauna. The hike ended on this fabulous private beach! We were collected by speedboat and whisked back to the resort. You can arrange a private dinner on the beach, can you think of a more romantic spot! 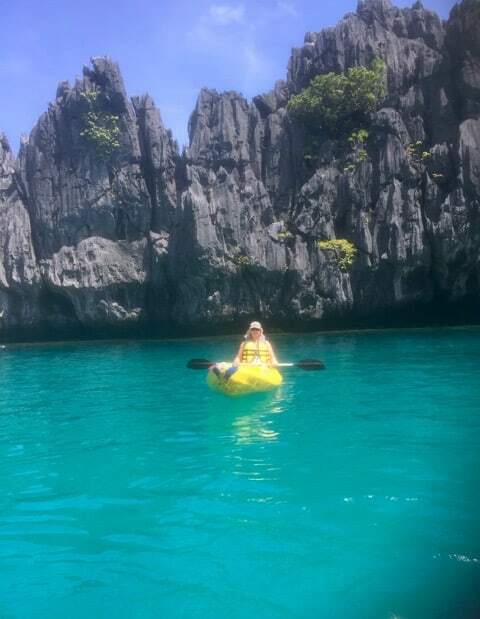 Or, take one of the free Kayaks at the resort and Kayak to the beach for snorkelling and a sunbathe. 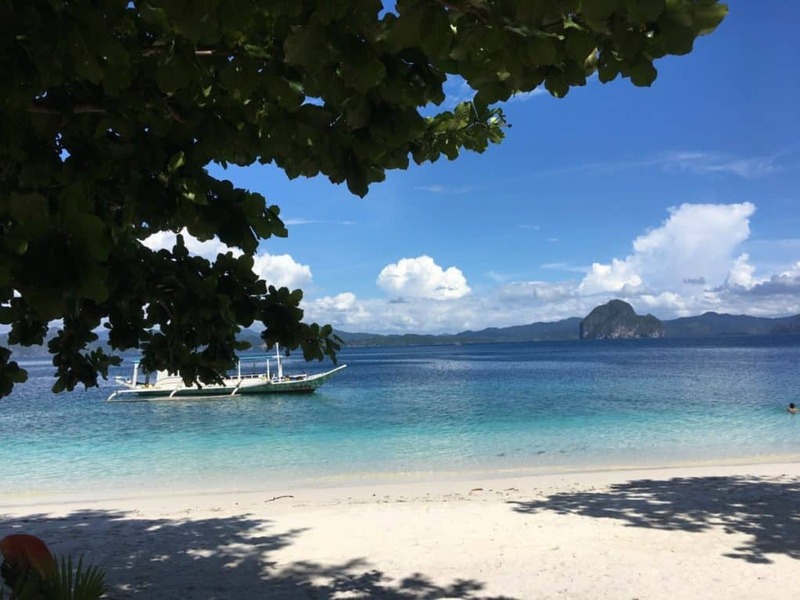 There is plenty to do to keep you busy during a stay on El Nido Islands, and I haven’t even mentioned the diving which is exceptional and can be arranged by the resort. 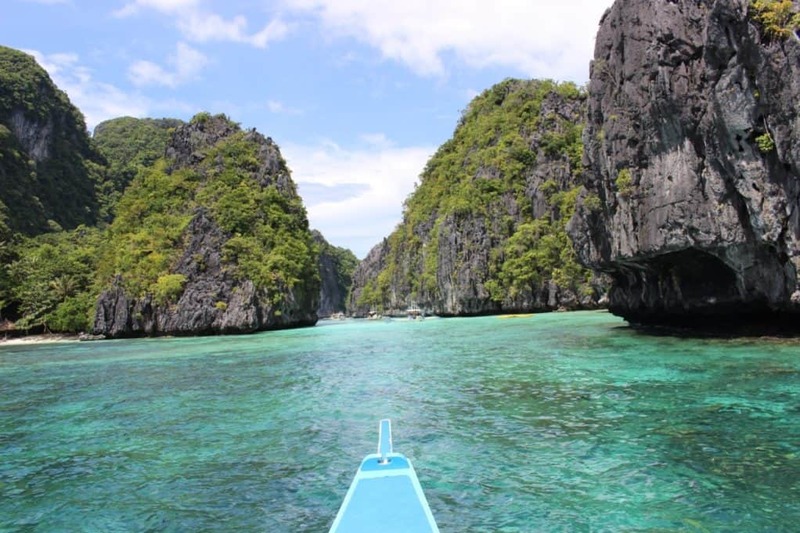 Thinking of Planning a Trip to El Nido? 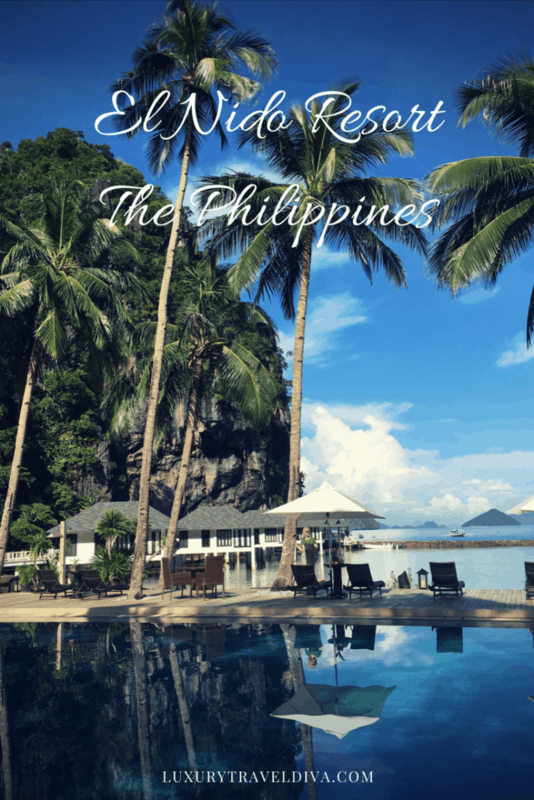 El Nido resorts have 4 resorts to choose from on different islands. 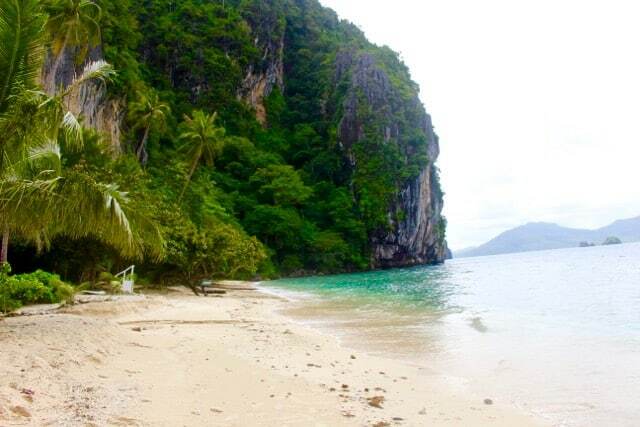 My choice would be Pangulasian Island, the jewel in the crown of El Nido resorts and opened a couple of years ago. Yes, a little more expensive but well worth the extra cost. This is a really special resort with exceptional villas and facilities. 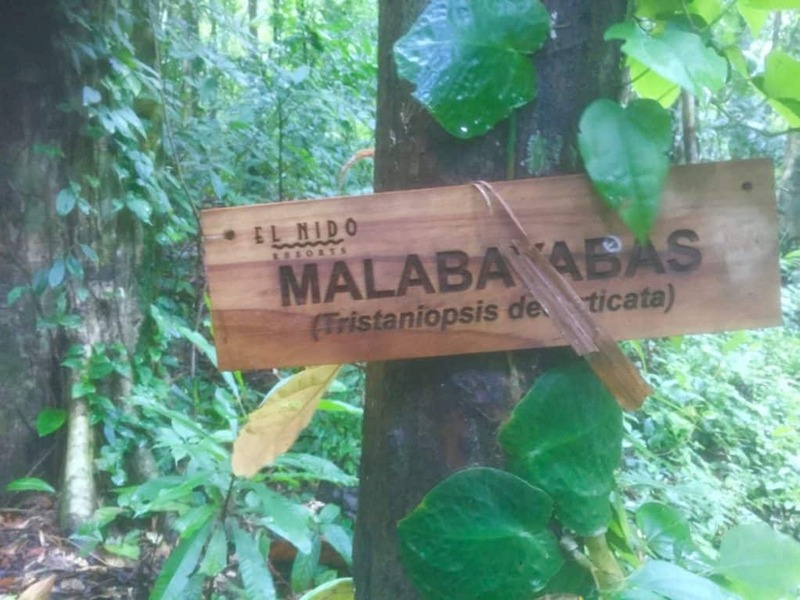 Read my blog dedicated to the island soon!